A great way to see New Zealand's unique beauty and many attractions is by hiring a rental car. 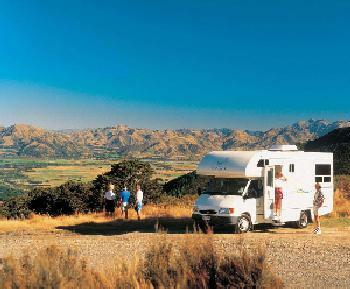 Another way to see New Zealand's unique beauty and many attractions is by hiring a campervan, RV or motorhome. For national coach/bus services, timetables, schedules and reservations for bus/coach operators travelling within New Zealand. Explore New Zealand with a range of bus and coach passes using the Magic Bus travel network, Flexi Coach Passes or the Nakedpassport. Bus and coach passes start from NZ$116.00 per person. There is a range of regular freight, passenger and car ferry services between the North and South Islands operating from Wellington and Picton. Also there is a ferry service between Stewart Island and Bluff at the end of the South Island. Major cities and towns are services by a range of airlines flying within New Zealand including Soundsair - Wellington and Picton, Southern Air between Invercargill and Stewart Island and Air Coromandel - between Auckland and the Coromandel Peninsula. There is a range of 'Mix N Match' independent travel touring packages from 3 days/2 nights, complete with accommodation, transfers and travel. A great way to see New Zealand.